Macon and Erin are building a life together. With their past in the rear view mirror, they need to find a way to survive a harrowing ordeal and make their dreams together come true, for themselves, for their daughter Lyric and for those that have been lost. They will need to dig deep to find the courage to keep running forward toward freedom. Q and T never had a chance - Weaned on blood and flesh, living in underground tunnels and sewers, struggling to survive and find their way in the dark with only a mother’s love to keep them safe (?) and a disturbed father that just may be the end of them all. Family is everything. I was fortunate enough to receive the Audlble version of On the Lips of Children from Mark to check out and review. Fortunate, indeed. 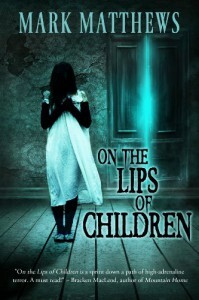 On the Lips of Children is a very good, character driven, dark fiction/horror tale that will make anyone that has children squirm in their seat. The narration was excellent and the pacing of the story was perfect. The story itself was simple enough, but the themes and concepts went much deeper and rang with interesting social and psychological tones. Mark did a wonderful job of building up the tension and the feeling of foreboding. The story and never strayed into cliché’ gimmicks or cookie cutter “horror” to provide his thrills and chills. Several times I found myself thinking I knew what was coming and was wrong…must have been my cookie cutter brain. Sometimes you run for fun. Sometimes for the endorphins. Somtimes....for your life. And sometimes you need to stop and make a stand. Solid 4+ Stars! Highly Recommended! The concept of The Tribe (the bums) serving “the family” by feeding them tourists in exchange for drugs and their own safety was really intriguing to me and worked perfectly in the storyline. Created a very dark and chilling atmosphere throughout.